Chicago Community Areas | Chicagoland Home Inspectors Inc. The community areas in Chicago, as defined by the Social Science Research Committee at the University of Chicago beginning in the 1920s, are 77 geographical divisions of Chicago. They are now used by the City of Chicago for statistical and planning purposes.These areas are well-defined and static. Census data are tied to the community areas, and they serve as the basis for a variety of urban planning initiatives on both the local and regional levels. The Social Science Research Committee at University of Chicago originally defined seventy-five community areas during the late 1920s. At the time, these community areas corresponded roughly to neighborhoods or inter-related neighborhoods within the city. In the 1950s, with the city’s annexations for O’Hare International Airport, a seventy-sixth community area was added. Other than the creation of the seventy-seventh community area in 1980 (by separating Edgewater from Uptown), boundaries have never been revised to reflect change but instead have been kept stable to allow comparisons of these areas over time. Community areas are distinct from the more numerous neighborhoods in Chicago. Community areas often encompass groups of neighborhoods. Although many community areas contain more than one neighborhood, they may also share the same name, or parts of the name, of some of their individual neighborhoods. 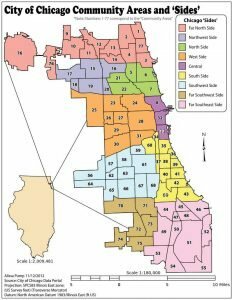 Political wards of the Chicago City Council are also a distinct geographic concept but may be important in reading history or in modern contexts; they however are redistricted over time and their boundaries change.